Cookies are like the poor middle child of the dessert world; Not nearly as elegant and grand as a layer cake, or cute and charming like a pie. When asked to make something special for a celebration, I almost always rely on cake or pie. April has been such a busy, busy month filled with birthdays that I just haven't had time for my usual celebration cakes. Cookies take far less time to bake up. And if they need to gussy up a bit (they are going to a party after all!) I like to whip up a frosting, filling, or spread to sandwich inside them. Sandwich cookies are feel just that much fancier than any plain cookie can. 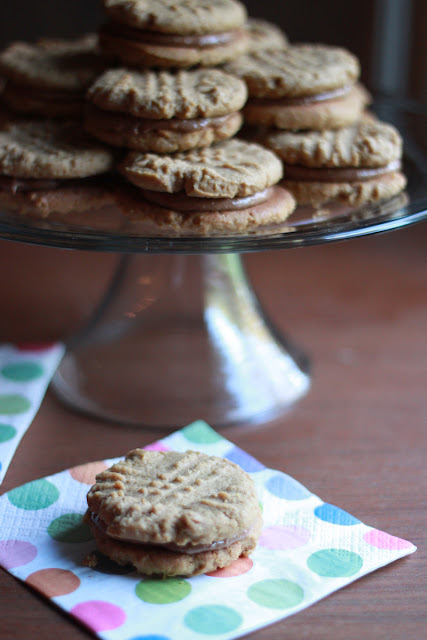 These cookies are a combination of my favorite flour-less peanut butter cookie and a quick and delicious peanut butter and milk chocolate spread. You will have extra filling and you will eat it from the jar on a spoon in private. Beat together the peanut butter and sugar in a large bowl until well combined. Add the egg and baking soda and beat again thickened slightly. Scoop into 1 ounce rounds onto parchment paper lined half sheet pans. Use a fork to flatten the round to 1/4 inch thickness. Bake for 10 to 12 minutes or until the cookies look dry. Cool completely on the half sheet pans. Sandwich about a tablespoon of Milk Chocolate and Peanut Butter Spread between cookies. Puree the peanuts in a food processor for 5 minutes. Add the chocolate and salt and process until smooth. Store at room temperature in an airtight container. Girl..there is no flour in these? I need them like now.. and that chocolate peanut butter spread has my soul doing the Harlem Shake.. The spread will change your life - seriously! 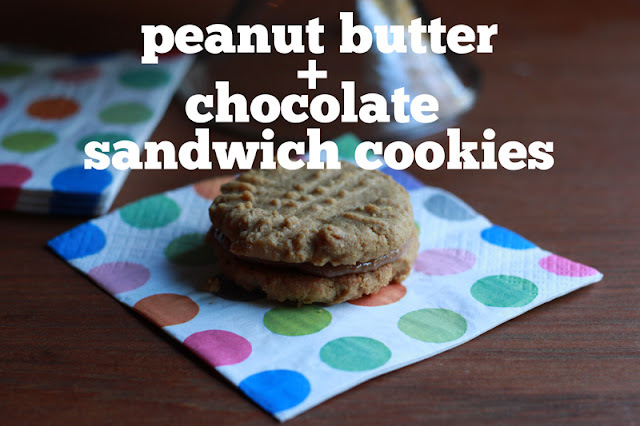 Your cookies look so cute and I love the sound of that milk chocolate and peanut butter spread! Thank you - You really should try the spread - its even easier than any version of Nutella I've tried and, dare I say, tastier?